Some of you are forever complaining (heh) about my being hard on your book budget. Well, today I am here to save you money. (You're welcome.) Which is probably a harsh way to introduce As Always, Jack but that's pretty much the way I feel about it. 2. It is set in World War II. I accepted it without a whole lot of consideration beyond those two points and then lived to grimace over my decision. Now, you should probably know right up front that this book is a collection of real letters which were written by Jack Sweeney to his then-girlfriend when he was stationed overseas. 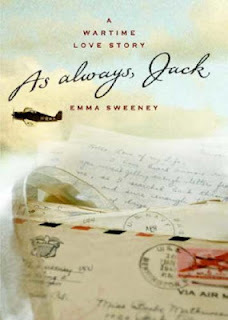 Jack eventually married the recipient of these letters and they had several children, the last being Emma Sweeney. Emma never knew her father as he died in service to our country before she was born. It is through the letters which he wrote that she finally had the opportunity to meet the father she never knew. On the one hand, I do realize that I should probably have great sympathy for this book. The problem might be that I didn't realize they were real letters until I had reached the conclusion. Most of the time I was reading it I couldn't believe that anyone would write the types of letters which are contained in these pages. For one thing, I thought these were fictional because in almost every letter he gives the exact location on the map of where he is stationed. In almost every piece of war correspondence or bit of history that I've read, I've always seen exact locations crossed out. (They were much better at keeping secrets back in the day.) This impression contributed to my belief that the letters were fake. Then too, Jack Sweeney must have been over the moon about this gal he liked because he was over-the-top in expressing his giddy passions. (If I had received letters such as these I would have rolled. my. eyes.) I guess I find it hard to believe that any man would actually say to a woman in writing (or otherwise), "Hiya, Toots!" and live to see another day. "Here I am again. Honest, I've never been like this before in my life - if I'm not mistaken, this is the third day in a row I've written you, and I always thought guys who wrote every day were nuts. Writing you is the next best thing to (1) being with you or (2) reading a letter from you, and since I can't do either (1) or (2) right now, I'll write a little nonsense." Writing nonsense is, in fact, something that Jack seems to do quite well as the book is full of it. Mercifully, (for the general population who are not related to Jack and his bride), the book is also incredibly short. It took me less than an hour to read through his letters. (Grant it, I confess I also skimmed the last 1/4th of them because they were all more or less the same. What I did like about the book was Emma Sweeney's writing voice. She introduces the letters by telling the story of her birth and then she concludes with some of her thoughts. Her writing style is beautiful and I regretted that the book was designed to focus more exclusively on Jack's actual letters. I think that I would have enjoyed it more if Emma had been more selective in sharing the actual text, and had filled in the details and facts about her parents with more narration. The front cover of the book advertises it as being "one of the greatest love stories of our time." I rather disagree but then I don't spend a lot of time reading romances because I do tend to find them over-the-top. I can't recommend this one but if Emma Sweeney wrote a book using her own words, I would be very much inclined to give her another go! I received a copy of this book from TLC Book Tours in exchange for participating in a book blog tour in which I am to share my honest opinion. I have faithfully give it, for better or for worse. Hmm. The premise of the book sounds appealing. But I can't help but wonder if he or his wife would have been embarrassed to death at the thought of their letters being publicized. I certainly wouldn't want any of my love letters put out there for the general public. What's precious and funny between those in love does seem silly and awkward to others looking at their words (even my own children would roll their eyes at ours). It does sound like it would have been better for the writer to tell the story and then just share a few excerpts. Your perception is always so good...it's why I trust you. So I'll just look for another book by Emma Sweeney. I loved your commentary on the book and I can totally agree with the eye roll however I have to give my two cents worth of war letter writing. I am guessing they put the exact map placement of each letter in when they were going through publication. You are correct, He would not have been allowed to write it to her. All correspondence would have been censored and redacted. I think that couples who are able to express themselves in letters "over the top" are the ones that will grow together, stay together and communicate better as they are apart for months and years through their relationship. I know that Mr and I write very dramatically and much more expressively when we are apart, because in order to get our feelings and expressions on paper (or and across to the other person we have to almost overdramatize. The excerpt from Jacks letter to his wife could have come from either Mr or I! I agree that reading personal correspondence is usually not the best book read, it has to be one of those personal taste choices. I probably wouldn't read a whole book of Jacks correspondence but I do read Mikes emails over and over again and I realize how special it must be for his daughter to know Jack through his letters to her mother. For me, I can smile about Jacks letters because I've been there on the receiving end and being called a pet name and told I am the most precious communicator in the world is a very wonderful thing! I think Hiya, Toots! is really cute. While I can't imagine anyone saying it now, I can totally picture it back in the '40s! Sorry to see you didn't like this one. I actually enjoyed it and thought it was an interesting way for Emma to finally "meet" her father. I'm with Trish in thinking that the "Hiya Toots" was probably more acceptable in the 40s. I thought the beginning chapter from Emma's point of view indicated it was non-fiction; maybe he was able to include his location in his letters because his service started after the war had ended?